In these fact sheets, students will read about how the third Globe theatre was built and how it both differs and is alike to the original. The current Shakespeare’s Globe in London can be called the third (reconstructed) Globe. It is the work of many people; but it would never have been built without the persistence of the man who first had the idea – Sam Wanamaker. Sam Wanamaker was an American actor and director whose first job (in 1936) was performing Shakespeare in an approximate reconstruction of the Globe theatre at the Great Lakes’ World Fair, Cleveland Ohio, USA. In 1970 Wanamaker set up the Shakespeare’s Globe Trust to actively pursue his long-term dream of building a reconstruction of the original Globe theatre. It took 23 years to find land, get planning permission and raise the money for the work. He died in 1993, while the building was still under construction. How was this Globe built? Shakespeare’s Globe was built as close to the site of the old Globe as possible – just one street nearer the river. Working with architect Theo Crosby, The Shakespeare’s Globe Trust did huge amounts of research to make the theatre as accurate a reproduction as possible. The builders, McCurdy and Co, began at the very beginning. They used the same kind of wood the original builders would have used: green oak. They went out and chose the trees for the stage pillars. They used the same techniques and tools to shape them as carpenters in Shakespeare’s time used. They couldn’t do everything in the same way. Safety regulations meant they had to use modern scaffolding and cranes. But they made every joint in the same way and fixed the timbers together using wooden pegs. Building regulations mean that they had to line the thatch with fire-retardant material. How is this Globe different? Modern health and safety rules mean that the reconstructed Globe has to have more exits than the original and there have to be fire doors. There have to be stewards on duty to look after the audience. Modern ideas of comfort mean that the bench seating is numbered, rather than the audience crowding together. What plays are performed at this Globe? 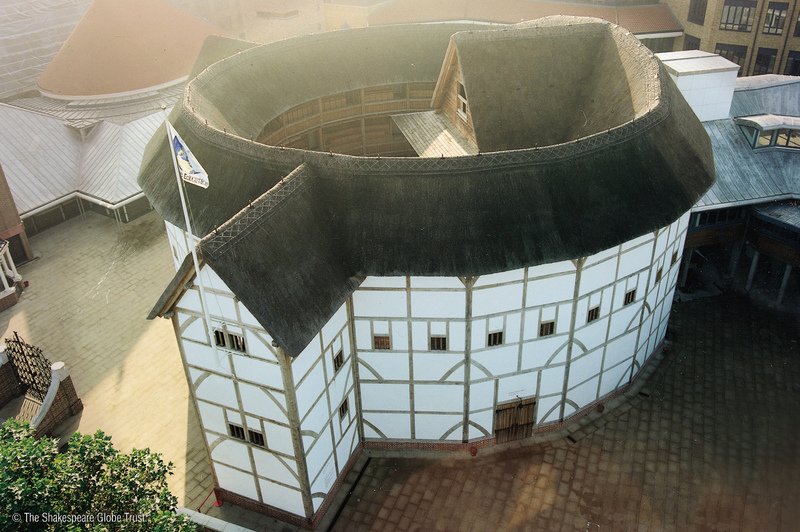 The first performance at the Globe (in 1993) was in German, and was performed while the theatre was still being built. The Globe was completed and officially opened in 1997. It also puts on new plays each season, written for the Globe. After all, in Shakespeare’s time all his plays were new plays! For more information on the Globe, download the Shakespeare’s Globe 360 app. Packed with interesting facts, videos and photos, the free app allows anyone in the world to explore a virtual version of the world’s most iconic theatre. Click here to find out more.